Score! 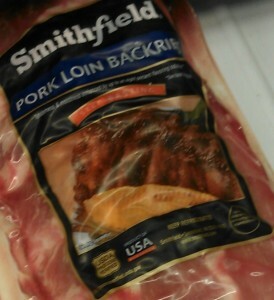 We bought the last pack of Smithfield ribs! Now it’s time to grill! I’m not a good cook in the kitchen. I’m not even a good grill cook. I lack some sort of innate gene when it comes to cooking. I cook dinner for my family 4 nights a week. I throw together a quick breakfast for my children on school mornings. I pack school lunches. As far as food prep goes, I get the job done…but that’s about all. My family exists on a steady diet of pasta, Mexican food, and leftovers. Thank goodness my husband is here to cook! My husband works late a few nights a week and often has to chaperone sports games and activities at his school. He’s a high school administrator. Because he is gone I am the head cook most nights. But, when he is home he grabs the the oven mitt and apron and gets cooking. He’s a good short order cook. Cooks a great breakfast. But his cooking prowess is truly in grilling. He learned to grill by watching his dad. I grew up in England where grilling hamburgers, hot dogs, and ribs is not popular at all. In fact, eating outside is not common, even in the summer as the weather, at least where I live is unpredictable in the summer. My husband, on the other hand, spend many summer days and evenings watching his dad grill hamburgers, hot dogs, and ribs. When we were first married, my husband’s fellow teachers chipped in to buy a BBQ grill for a wedding gift. When I unwrapped the gift, I wondered where we would put this grill or even if we would use it. We had a tiny townhome with a n even tinier front yard. I needn’t have worried about using that grill! Since we were the only ones in our group of college friends who were married and had a home, our house became the meeting place on summer nights. My husband honed his grilling skills for our friends. Is there anything better than grilling with friends? We hauled that BBQ grill to our new home and the grilling parties continued even when we had a baby, and then another baby, and then another baby! Our friends loved joining us for cookouts of ribs, hamburgers, and hot dogs. Now that my children are kids, tweens, and teens, our calendar is chock-a-block full of sports and school activities…so are our friend’s calendars. Getting together to BBQ is tough to do, so mostly we grill for family. Yesterday, we grilled at my father-in-law’s house after I purchased Smithfield Pork Loin Back Ribs at Walmart. My father-in-law grills a lot. In fact, when I first met my husband his dad had a brick charcoal grill in his backyard. He has since dismantled the grill and now only uses a BBQ grill. My husband prepped the Smithfield Pork Loin Back Ribs at home. 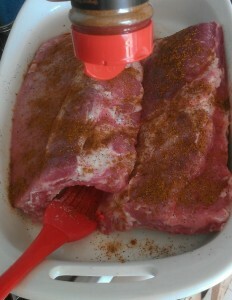 He brushed ribs with Canola oil so that the spices would really stick. He coated both sides of the ribs with salt, ground black pepper, granulated garlic, and a seasoning blend of herbs and spices. The ribs were golden brown once he had poured on the seasonings. We wrapped the ribs in foil and drove to my father-in-law’s home about a 20-minute drive away. Just enough time for the rub to settle in and add oh-so-many flavors. I could NOT wait for dinner time! Grilling up ribs, hamburgers, and hot dogs! Once we arrived at my in-law’s house, we let my father-in-law take over. 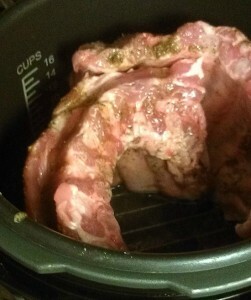 He suggested that the ribs should go in the pressure cooker for 6 minutes. My husband readily agreed. Once the ribs were done, my husband and his dad set about grilling the Smithfield Pork Loin Back Ribs, as well as hamburgers and hot dogs. My father-in-law had prepared a green salad, coleslaw, baked beans, corn, and a potato-zucchini-red pepper dish that he cooked on the grill a long with the ribs. Farmland and Smithfield ribs come in Baby Back Ribs and St. Louis Style Ribs. Farmland and Smithfield ribs are the perfect dish to show off a favorite recipe and celebrate life with good people and gorgeous weather. I don’t know about you, but after the cold, bleak, miserable winter we had, there is nothing I want to do more than soak up the sun and eat outdoors! Just in time for summer feasts and barbecues, here’s a coupon to save $1 on your purchase of Farmland and Smithfield ribs! My husband used a salt/pepper/granulated garlic/seasoning blend rub, followed by a spin in the pressure cooker prior to grilling. 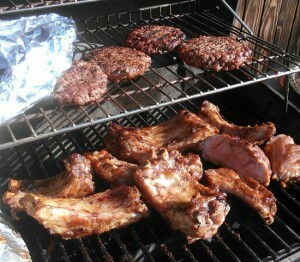 You may want to use your family recipe or use one of the recipes suggested by the BBQ Pitmasters at ReadySetRibs.com. The BBQ Pitmasters have provided special grilling tips that are available for you. These BBQ Pitmasters know their grilling!